-$1,000 Off Instant Discount – Select Coupon! The Osaki-JP Premium 4.0 provides an in-home massage experience unlike any other. Imported from Japan by Fujiiryoki, one of the oldest and most respected massage chair brands in Japan, it’s one of the few massage chairs engineered in Japan. The Osaki-JP Premium 4.0’s stand out feature is its exceptional 4D massage roller heads. The highly advanced 4D system permits the user to protrude the roller heads up to 4.9″ into the neck, shoulders, and back to enjoy a true deep tissue massage. But it’s not just for users seeking a firm massage. The 4D system has 9 intensity settings, making it the perfect fit for the entire family. Whether you’re 5’0 or 6’3, the Osaki-JP Premium 4.0 will personalize the massage for your frame utilizing its “Double Sensing” computer body scan to ensure all the right areas are massaged every time. As the rollers methodically massages the the back, enhance your massage experience as heat therapy melts away muscle aches in the upper torso and on the underside of the foot ottoman. 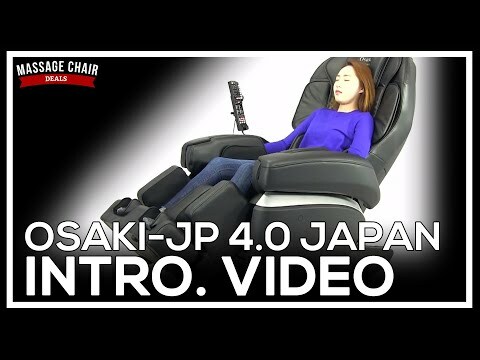 The Osaki-JP Premium 4.0 offers 8 auto programs in two intensity variations and 17 kneading functions for a total of 85 unique massage combinations. Plus, sit back and relax as the 4.0 delivers a deep stretch targeting the neck, shoulders, back, and waist. The chair’s cutting-edge air compression system — 36 airbags in total — will stretch and twist the waist, shoulders, hips, pelvis, arms, calves, and feet as the rollers travel up and down the spine. Choose from 3 unique airbag modes and select from 5 airbag intensity levels. With the Osaki-JP Premium 4.0, fine tuning is just a tap away. Adjust the intensity, with and speed of the roller heads, target specific nagging areas of the body, and much more with ease. If you prefer to have your massage chair brought inside your home or residence, a Threshold Delivery upgrade is offered for this massage chair. Your massage chair will be brought just beyond the main entrance of your residence or business, but not to a specific room. It can also be stored in your garage. This shipping method does not include assembly. Threshold Delivery is a happy medium between free Curbside Delivery and White Glove Delivery. The vast majority of our customers are most concerned with the hassle of hauling the chair into their home or business, and are capable of assembling the chair themselves (if necessary). This is fulfilled with Threshold Delivery. The Made in Japan Osaki-JP Premium 4.0 has many stand-out features, but among the top of the list is its exceptional human-like roller technology. A Japanese-quality chair is unique in its ability to dig into the shoulder blades, neck, and back more effectively than their Chinese counterparts. The Osaki-JP Premium 4.0’s new 4D roller technology offers users the ability to manually select how far the rollers dig into the back. The 4D system massages side to side, up and down, and in and out. 4D technology also introduces a new speed component which mimics the life-like style of a human massage therapist. The 4.0 has a 30″ track, which massages from the nape of the neck down past the tailbone. The Osaki-JP Premium 4.0’s 4D system has the capacity of an industry-leading 4.92 inches (12.5 cm), making this model one of the best deep tissue chairs on the market. But it’s not just a chair for users who prefer deep tissue massages. It’s equipped with 9 roller intensity settings — from weak to deep tissue — making it the perfect chair for users who enjoy anywhere from a mild to true deep tissue massage. Simply increase or decrease the roller intensity on the remote control during your massage session to set the firmness of the rollers depending on your level of tolerance. The Osaki-JP Premium 4.0 integrates two innovative “Double Sensing” body scanning sensors to personalize the massage for your unique body frame. During the first stage, the rollers map your spine’s curvature. During the second stage, the body scan detects your shoulder line relative to your neck and head. The chair makes micro adjustments based on your body type and accurately detects an ideal roller start point on the top of the neck. If you find that the roller position start point is too high or low, you can override the scan’s results and higher or lower the start point after the body scan has completed. The Osaki-JP Premium 4.0 boasts two infrared heating sources built into the chair. The first is located in the shoulder area, which is where most tension is formed, making massaging the area difficult. The incorporation of a heat element higher up in the backrest of the chair solves this problem, especially when you consider that Japanese chairs provide an exceptional shoulder blade massage. The second heat element is located on the bottom of the footrest. This mild heat source warms up the soles of the feet to alleviate any tension as the airbags wrap around the feet. 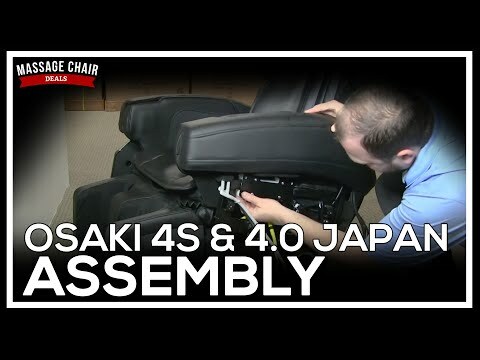 The Osaki-JP Premium 4.0 includes 36 air compression bags that are strategically placed throughout the chair to ensure everything from the neck down to the soles of the feet are massaged. The airbags massage the outer shoulders, legs, calves, hands and arms, inside the seat, and the waist/pelvis area. The Osaki-JP Premium 4.0 has an intelligent airbag system that allows you to choose what type of airbag massage you prefer, instead of just one uniform airbag mode for most other models. They include a Hand Knead Mode for the hands and arms; a Pulse Mode to support the promotion of blood circulation by repeating the air supply and depleting little by little; and a more traditional Normal Mode, which focuses the position and massage by repeating the air supply and depleting largely. Pulse Mode and Normal Mode can be selected for any of the airbags, whereas Hand Knead Mode is exclusively for the arms and hands. There are five intensity levels for the airbags, from weak to strong. The Osaki-JP Premium 4.0 features two large air compression bags located behind the shoulders. The airbags inflate on the back of the shoulders, lifting the shoulders up and twisting the body from side to side when they inflate independent of each other, creating an enjoyable deep stretch. Located on both sides of the seat base, two airbags target the hard-to-reach hip and pelvic muscles. The waist airbags are designed to hold the user in place and stretch the hip muscles. Airbags are also located inside the seat, inflating upwards into the backrest of the chair, to reach the pelvis and gluteal muscles. Combined, the one-two-punch of airbag technology in the waist and around the glutes reduces lower back pain and improves hip mobility. The Osaki-JP Premium 4.0’s armrest pockets offers a unique butterfly-style design which aligns the arms in a more comfortable position compared to other massage chair models. When inserting your arms into the arm panel flaps, the airbags inflate and contour around the arms, palms and hands to provide a relieving, kneading-style compression application. Down in the footrest of the chair, the airbag system has been newly improved to massage the calf and foot muscles more accurately. Around the legs, the airbags grip the calves and slowly increases the amount of air that flows into the airbags, stimulating the acupuncture points. Down in the wells of the ottoman, the airbags press down on the feet, putting them into closer contact with the sole nodes. This comprehensive massage will leave your legs and feet feeling revitalized after just one session. The Osaki-JP Premium 4.0 has four auto courses: Whole Body, Shoulder, Waist, and Stretch. Each of those auto programs has two massage intensity variations: Relax and Extreme Mode. Relax Mode results in a gentler roller massage, whereas Extreme Mode (or Ex-Mode) results in a deeper tissue massage. The Osaki-JP Premium 4.0 excels in its ability to offer in-depth approach to massaging the neck, shoulder, waist and back unlike any other model on the market. This model incorporates 17 kneading massage styles and adjustments that can be performed during each technique. New in this model is the integration of a new sensor which offers a rubbing feature during the kneading modes. When combining the different modes this chair is capable of, a total of 85 unique massage techniques are possible. There are four main manual massage functions: Basic, Mode, Part (1), and Part (2). Within those manual functions are several sub-menu massage techniques and regional massages. All of the Basic and Mode massage techniques will allow you to choose from four kneading speeds, adjust the width of the rollers (Narrow, Middle, or Wide), select the 4D depth (up to 9 levels), and massage either the whole body, a partial area of the body, or a specific area of the body. With 85 massage techniques possible, the Osaki-JP Premium 4.0 is in a class of its own when it comes to its fine tuning measures. Independently adjust the angle of the footrest and backrest to your ideal position by simply tapping the up or down buttons on the remote control. The Osaki-JP Premium 4.0’s remote control conveniently comes with its own stand to place on when not in use. Navigate through the auto programs and an entire suite of massage techniques, reclining positions, fine tuning measures, and much more with ease. Suggested User Height 5’0 – 6’3 ft. Suggested Max. User Weight 285 lbs. Weight Product net weight: 164 lbs. If you prefer to have your massage chair brought inside your home or residence, a Threshold Delivery upgrade is offered for this massage chair. Your massage chair will be brought just beyond the main entrance of your residence or business, but not to a specific room. It can also be stored in your garage. This shipping method does not include assembly nor the removal of packaging. Threshold Delivery is a happy medium between free Curbside Delivery and White Glove Delivery. The vast majority of our customers are most concerned with the hassle of hauling the chair’s packaging in their home or business, and are capable of assembling the chair themselves (if necessary). This is fulfilled with Threshold Delivery. Osaki guarantees that your qualified product will be replaced or repaired at our option, without cost to you, should it be deemed defective because of faulty parts, workmanship or structural defects during the first five (5) years of ownership. This warranty plan includes three (3) years of in-home labor, four (4) years of parts and structural framework, and five (5) years of structural framework. NOTE: On Japanese-made massage chairs from Osaki, the maximum 5 year extended warranty is offered at no additional cost.